Holy lightning bolts of fury, ya’ll better hold on tight. 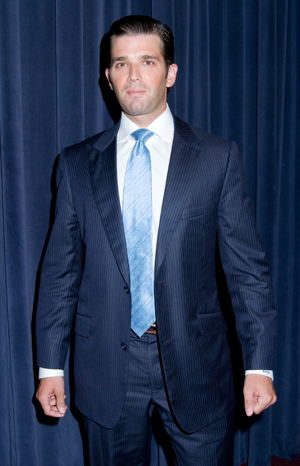 Donald Trump Jr. and his brother Eric are under a heavy storm of criticism after a colourful array of photographs from their Zimbabwe safari and hunting escapade hit the net. The photos depict the Trump duo displaying their kills in various scenarios and poses, including a particularly scandalous shot of Don Jr. holding an elephant’s tail in one hand and a knife in the other. Some of the other animals that sadly met their untimely end were a kudu, a civet cat and a crocodile. Of course, the boys could not sit idly by and watch their photographic conquests savagely — albeit only verbally — brutalized by those pesky PETA people. And surely — because the hunting expedition was only for their benefit — the villagers were also really grateful for the gruesome photos depicting the Trumps and their kills, such as a crocodile in a noose and hanging from a tree. Their defence of the hunting trip would stand a bit more sturdily if there was no photographic, not to mention brutal, evidence implying the extent of their might when armed and even their overt animal bigotry. If only there was another way millionaires could supply African villages with food without physically butchering exotic animals; if only there were organizations created for that specific purpose… If only! Alas, they are in quite the pickle. “If the young Trumps are looking for a thrill, perhaps they should consider skydiving, bungee jumping, or even following in their anti-hunting father’s footsteps and taking down competing businesses — not wild animals. If the Trumps want to help villagers, they have plenty of resources at their disposal,” read the statement from PETA. Obviously, the Trump brothers then engaged in a Twitter war with the animal rights activists currently flooding their feeds. But once the argument hits Twitter, it becomes as aimless and uncoordinated as an angry mob during an uprising — just saying/doing things for the sake of saying/doing things. PETA should launch an action campaign to draw more support for its endeavours by releasing a slow-motion video of Pamela Anderson doing all sorts of animal-friendly acts set to the musical accompaniment of Sir Paul McCartney. That just sounds like an excellent marketing tactic, right there.